Front Porch Makeover with Modern Masters Front Door Paint! 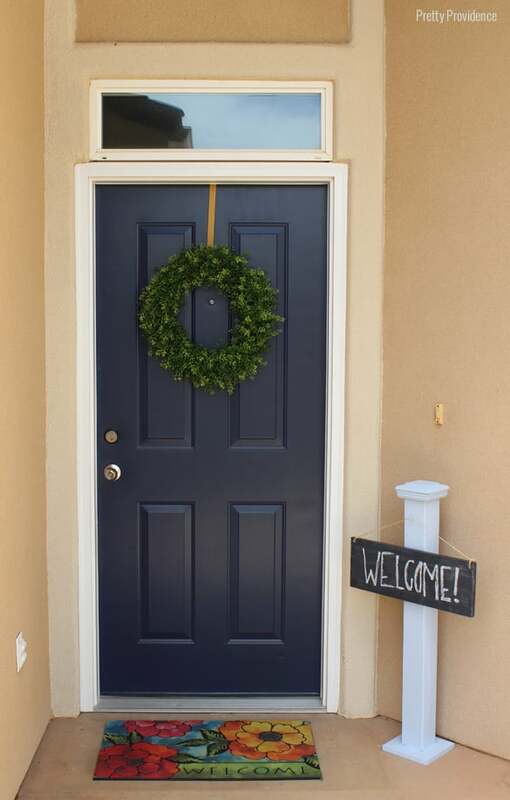 So I have been wanting to paint my front door for like… ever. For some reason though, I just couldn’t commit on the color! Navy is my favorite color right now and that is what I wanted to do, but I was really unsure about how that would look on my house. THEN I heard about Modern Masters front door paint, and they have this free app you can download (just search “front door paint” in the app store) where you take a picture of the front of your house, and it allows you to test out all their different colors so you can see how they look with your current exterior! Genius, I tell you. I tested out a bunch of colors but couldn’t sway myself away from the navy! The color I chose is called Peaceful, and I’m pretty obsessed. The paint went on easy, dried super fast, and hasn’t worn at all! Totally weather resistant, too. 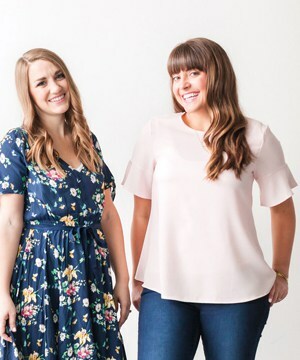 I loved it so much that I am giving away two quarts of front door paint to two lucky readers today! I’m telling you.. you guys will love this stuff! Okay, now who’s ready for the ugly before picture?? Oh and the details of the front porch makeover of course! Pretty basic right? If your porch needs a little life like mine did, here are a few tips! 1) First step clean the area. 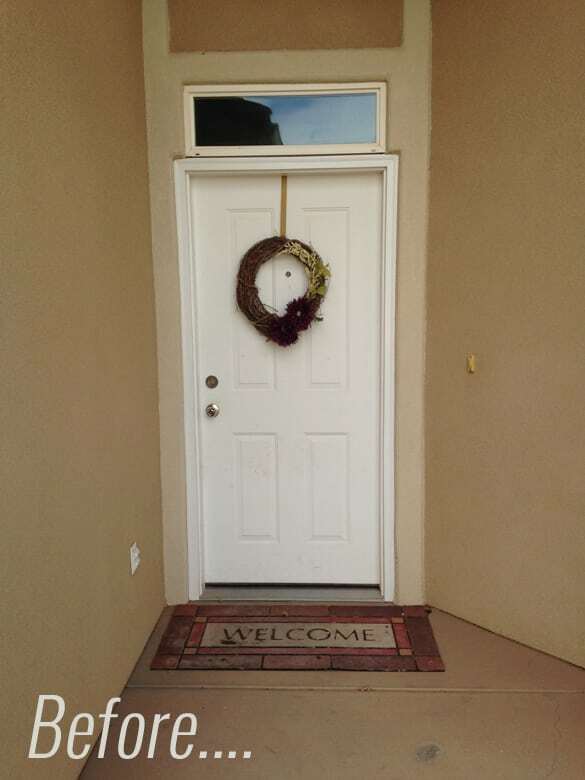 I was seriously amazed (and embarrassed) how much better my door looked when it was clean! I am used to cleaning the inside and sweeping and stuff but apparently I don’t clean the outside of my door near enough! I used Windex and it worked like a dream! 2) Paint your door! You won’t believe how easy this step was! Seriously took just a few hours on a Saturday.. and now I love my new door! Check out all the paint color options here. 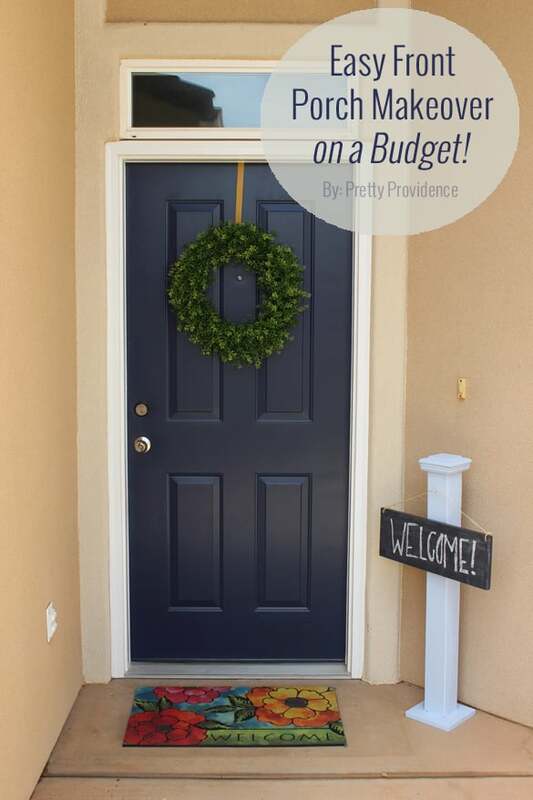 3) Every door needs a wreath! I love a good wreath DIY, find 60 of my favorites right here! 4) Step four.. rugs! Target and Lowe’s are my favorite places to find rugs (I got my new rug at Lowes for $12.99), but if you want to DIY yours, check out this fun tutorial of Sarah’s! 5) Lastly.. that something extra. I love plants, but I kill them all the time. 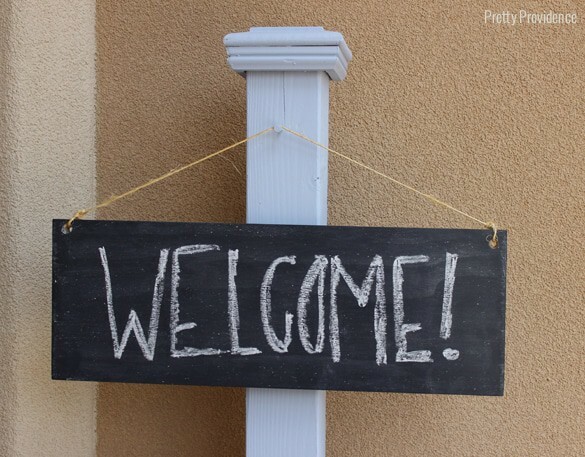 So, I decided to go for something wooden and I made this cute chalkboard sign and wrote “welcome” on it! These pots of Sarah’s are another fun idea. Pretty cute right?! I love that I can erase and customize the sign to say whatever I want! P.S. If you liked this post be sure to check out Sarah’s awesome DIY Modern Number’s Sign! *I received paint from Modern Masters in exchange for sharing my thoughts about the product in this post! All opinions are 100% mine, as always! Our door doesn’t deserve a new paint job it’s so awful… I love the way yours turned out!! When we get a new door, I’m planning to paint it a bright green, but your navy has me thinking twice it looks so nice! Oooh I love bright green! You’ll have to let us know what you decide! That navy color looks great! Looks great! I love that paint color you chose!